Bruce Ross received his Ph.D. in comparative poetics from the University of Buffalo, New York. A humanities educator, he is a past president of the Haiku Society of America. 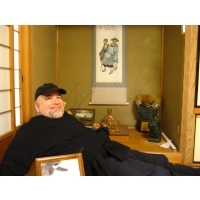 Bruce has taught Japanese poetry and painting forms in a variety of educational formats, including Empire State College, Burlington College, the University of Vermont, the University of Alberta, and the University of Maine. He has lectured on haiku in the United States, Canada, Japan, the Netherlands, Romania, and Sweden. His original haiku, senryu, haibun, tanka, haiga, and collaborative renga appear in many haiku journals worldwide. Press, 2012); Three haiku in Sacred Heart [ed. Robert Epstein](Modern English Tanka Press, 2014); Honorable Mention, 2nd Genjuan International Haibun Contest (2013) for "Pillars of Heaven"; Second Prize, 17th Kusamakura International Haiku Competition (2012); Commendation, Romanian Kukai Group Haiku Contest, Sharpening the Green Pencil (2012); Runner-up, 66th Basho Festival, Iga City (2012); Mayor of Nagoya City Award, "tai chi" haiku (2011); "Spaciousness as a Key Element in Haiku" delivered at the biennial Haiku North America, Seattle (2011); Chair and paper, "Haiku Mainstream: The Path of Traditional Haiku in America," Haiku Society of America session, annual America Literature Association conference, Boston (2011); Two haiku in Dreams Wander On, Contemporary Poems of Death Awareness [ed. Robert Epstein] (Modern English Tanka Press, 2011); Honorable Mention, annual Kaji Aso Haiku Contest (2011); First Choice (Best of Issue) Haiku Reality (December 2010); Special Award (First place) haiku and runner-up, 66th Iga City Basho Festival (October 2011); Special Award (First place) haiku and Runner-up, 64th Iga City Basho Festival (October 2010); Second Place, 16th Annual Robert Frost Haiku Contest (April 2010) and reprinted in The Saturday Evening Post (September/October 2010); Best haiku of issue, Modern Haiku 40:3 (2009) Mildred Kanterman Merit Book Award [for Contemporary Haibun 9, ed. with Jim Kacian and Ken Jones] (Haiku Society of America, 2009); "Thoreau's gravesite" in Ian Marshall, "Walden by Haiku" (University of Georgia Press, 2009); Third Prize, Robert Spiess Memorial Haiku Award (Modern Haiku 2008); First Prize, 62nd Basho Festival Certificate (Iga, Japan, 2008); Third Prize, International Haiku Contest, "One Thousand Cranes" (Romania, 2008); Second Place, moonset Haibun Contest, 2008); Second Place, Hekinan Haiku Contest (Japan, 2008); Third Place, 13th Annual Robert Frost Poetry Festival, Haiku Contest (2007); Honorable Mention, Vancouver Cherry Blossom Festival (Canada, 2007); Honorable Mention, R.H. Blyth Haiku Contest (England, 2007); First Place, World Haiku Review Haiku Contest (2007); First Place, Kaji Aso Studio Annual Haiku Contest (2006); 8th Apokalipsa Haiku Contest (Slovenia, 2006); Second Place, Mainichi Daily News Annual Haiku Contest (2005); Third Prize, Genkissu Haiku Contest (2005); First Place, Ito-en Annual Haiku Contest (2005); Third Prize, 8th Kusamakura International Haiku Competition (2003); Eighth Place, Annual Conference of Japan Society on Water Environment in Gifu (2001); Second Prize, Kumamoto International Kusamakura Haiku Competition (2001). Books Published: The Inheritance of Animal Symbols in Modern Literature and World Culture (Peter Lang, 1988); If Not Higher, Lectures on the Poetics of Spiritual Presence and Absence (Peter Lang, 1999); Venturing upon Dizzy Heights, Lectures and Essays on Philosophy, Literature, and the Arts (Peter Lang, 2008); Haiku Moment, An Anthology of Contemporary North American Haiku, ed. Bruce Ross (Charles Tuttle, 1993); Journey to the Interior, American Versions of Haibun [ed. Bruce Ross] (Charles Tuttle, 1998); How to Haiku, A Writer's Guide to Haiku and Related Forms (Tuttle Publishing, 2002); thousands of wet stones(M.A.F., 1988); The Trees (The Plowman, 1991); among floating duckweed (HMS, 1994); Silence, Collected Haiku (HMS, 1997); summer drizzles . . . haiku and haibun (HMS, 2005); endless small waves haibun (HMS, 2008); a scent of pine, A Maine Haiku Anthology [ed. Bruce Ross] (Tancho Press, 2011); spring clouds  haiku (Tancho Press, 2012); Traveling to Other Worlds, Lectures on Transpersonal Expression in Literature and the Arts (Peter Lang, 2012).